What man married Ruth when she came to Bethlehem? 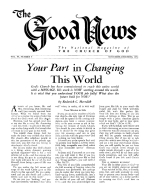 PREVIOUS articles in the "Good News" have discussed proper methods for cooking meat and vegetables without any specific recipes being included. At the request of many of you, we have decided to publish in this issue a few tested recipes which we believe will add variety and value to your daily meals. The following main-dish recipe has a barbecue flavor that you will enjoy. Beef in Spicy Sauce; For the meat portion, select lean veal or less tender cuts of beef such as heel of round or cuts from the chuck or brisket. Trim off excess fat before dicing it. Cut 1 1/2 pounds of lean meat into cubes approximately l 1/2 inches square. Mix together 2 tablespoons of flour, 1/2 teaspoon dry mustard, 1/2 teaspoon black pepper and one teaspoon of finely crushed or ground dried basil. Roll the meat cubes in this mixture, coating each piece well.